As our spotlight on Thailand continues, let’s talk about the crab. Globally, 1.65 million tons of crab are caught or farmed for humans to eat each year, making it one of the most popular crustaceans on earth. Interestingly, some of the animals we think of as crabs and may even keep as pets (such as the hermit crab) belong to different crustacean families; they are not actually crabs at all. Crabs have an outer shell, which in true crabs is their own exoskeleton, not a borrowed home as with hermit crabs. Their eight legs bend in such a way that allows them to squeeze into small holes for safety; this also causes them to walk sideways. Finally, crabs are characterized by a set of claws in the front. These can be used for picking up food (crabs are omnivorous), for defense, or for attracting mates. 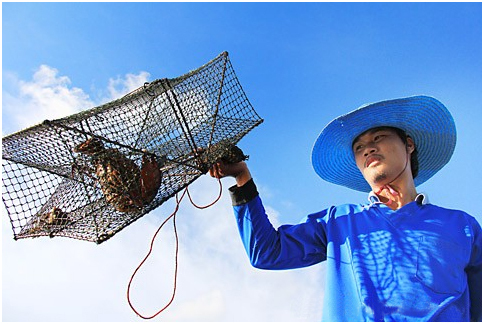 Crown Prince crabs are harvested from the clear waters off the coast of Thailand by use of crab traps. They are transported back to shore where they are cooked. Then, the meat is picked and cleaned by hand, sorted, and cleaned again before being canned. We offer 6 different crab varieties in total, across our Crown Prince, Crown Prince Natural, and Ocean Prince lines. Of course, for those of us who are not crab fishermen or aquatic biologists, the most exciting part about crabs is exploring the many ways of enjoying their flavor and nutrition once they reach your grocery store shelf. Some crabs (like the soft-shell crab) are eaten whole, while with others, we consume the meat inside the large claws and legs only. Globally, crabs are eaten in a variety of ways: from spicy Asian stews to American crab cakes to classic French bisques. Low Country Crab Cakes – A flavorful version of a timeless classic. Or incorporate crab into a favorite dish of your own. Bon appetit!